It is healthier for Pups to be kept lean. Weight is one of the easiest things to control because Pups eat what we feed them, they are not given the opportunity to make B-A-D food choices! 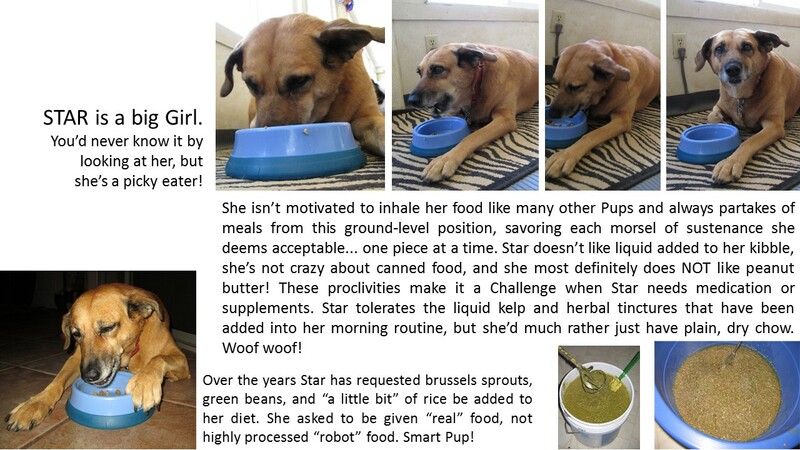 Pups are at the mercy of their People to provide nutritious, health-giving sustenance. Do NOT mistake Veterinarians for Nutritionists because they are not. Like bedside manner, such fundamental Knowledge is not considered vital to their Training. DO NOT feed your Pups anything that contains Xylitol as an ingredient!!! Xylitol is a natural sugar that is poisonous to Dogs. It is toxic to their systems. Read ALL labels! Avoid any items (for yourself as well as your Pups) containing BHA, BHT, ethoxyquin, or propylene glycol. FYI: those numbered dyes are added to food products to entice you…not your Pups. In my opinion the use of glycerin in food and Treats is unnecessary and unnatural. Glycerin is an additive/ preservative, it is NOT food; it is a ‘humectant’ with no nutritional value. I repeat: Read ALL labels! And when you see glycerin listed as one of the top four or five ingredients remind yourself of this: The glycerin form of propanetriol used in foods is one molecule away from the propylene glycol used in solvents and explosives! Remember, most Dogs don’t need (nor do they benefit from) soft Treats or Kibble. Feed Treats and Kibble made from wholesome, natural ingredients–and watch out for what they’re preserved with! Elevated bowls help some Pups eat more comfortably. Tall Breeds aren’t the only ones who can benefit from a raised eating surface; aged, injured, and recovering Pups often need this sort of thoughtful, circumstantial, In The Moment, TwoLegged assistance. Sometimes the shape of the food Bowl is important–the height and slant of the sides could mean the difference between a “Happy Bowl” and a (perpetually) dirty one. I believe that something as eagerly anticipated as meal time…something that happens only twice a day, should last for more than .75 seconds! 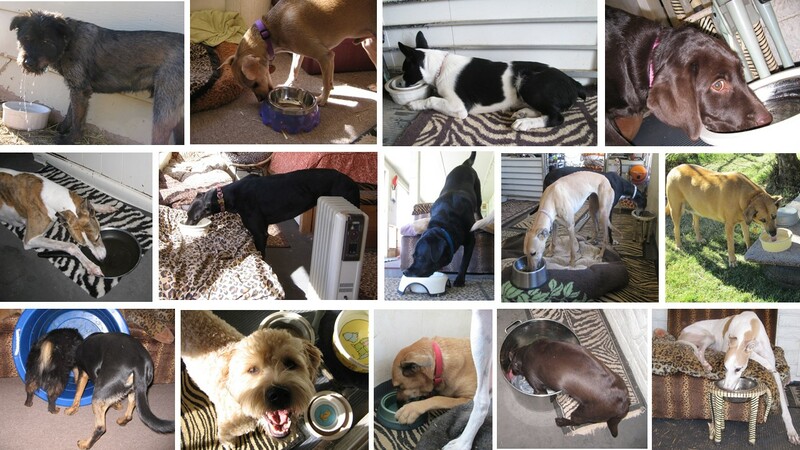 I’ve Learned from experience that when a whole Pack of Domesticated Dogs is being fed, each Pup needs to be kept occupied for as long as possible with its own Bowl. 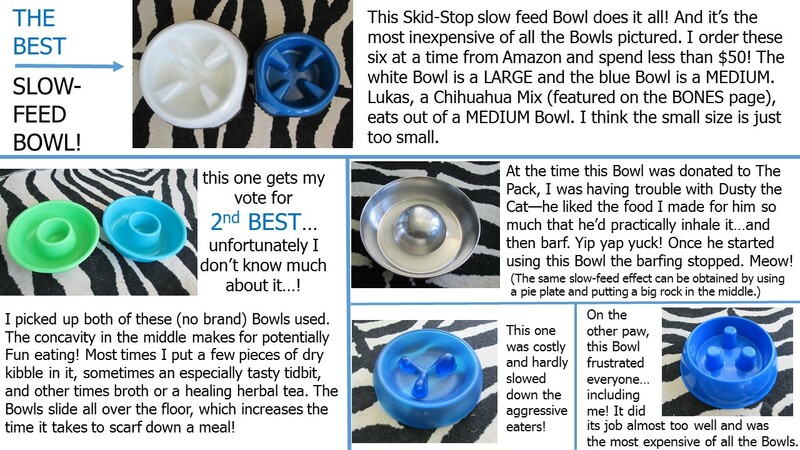 Slow feed Bowls are the answer for Dogs who wolf down their food. Have multiple water sources available. 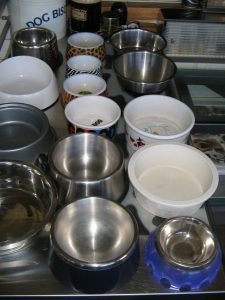 In multi-Pup Dens the water offered should be at different heights, in several Bowls. Drinking water needs to be fully changed out at least once a day. 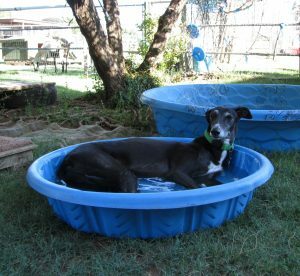 Where we live the water is extremely hard, so water Bowls need to be cleaned regularly too. Things start to grow in water after two days. For this reason pool water needs to be changed every other day and the pools themselves need to be kept clean. Need more motivation? The result of ingesting old or dirty water is usually diarrhea. Speaking of which… check out The Poop on Poop! Or maybe you have a question? Then Contact me! Woof woof!